Patti Lawrence at The Gallery of Local Artists on Broad Street poses by her portrait of Harry. When Patti Lawrence opened her art gallery on Broad Street a year ago, she noticed that every morning a solitary man would press his face up to the front glass and look in. Finally one day she took him out a cup of coffee. It was Harry, one of Kingsport’s downtown fixtures. And that simple act of kindness began a friendship. She painted from that and the result is a striking portrait that makes Harry look like an Old Testament prophet, full of widsom. She put the painting on an easel in the front window and waited for Harry to come by, a bit nervous about what his reaction might be. “Harry,” the painting, still occupies that honored place in her front window at The Gallery of Local Artists, 158 Broad Street, next door to T.K.’S Hot Dogs. It’s priced at $2,000. That’s just for the painting of Harry. 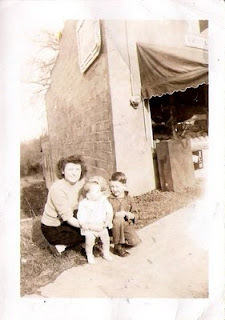 Patti wouldn’t take anything for her friendship with Harry. 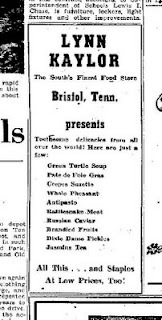 A 1947 ad in the Kingsport Times for Lynn Kaylor, a Bristol store that sold caviar! 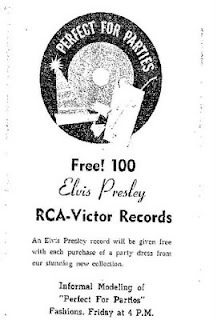 In 1956 if you bought your party frock at J. Fred's, you got a free Elvis record. 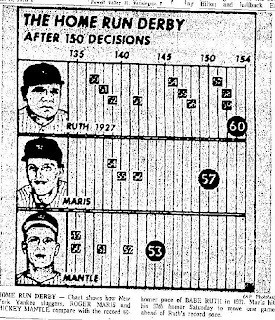 The Times News ran charts like this every few days to keep fans up on how Maris and Mantle were faring in their pursuit of Babe Ruth's home run record of 60 in a season. Hey, we didn't have ESPN or the internet. This was all we had. 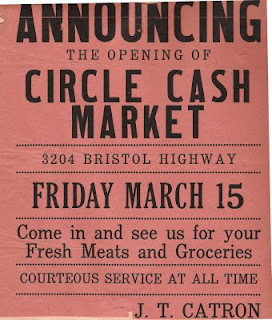 Poston's Grocery opened in 1947 as the Circle Cash Market. Here's the original opening handbill and a photo of owner James Catron's wife, son and daughter. Photo provided by that daughter Sherry Catron Salyers.